After studying this chapter, you should be able to . describe the general functions and 8. major components of the circulatory system. describe the composition of blood 9. plasma and the physical characteristics and functions of the formed elements of the blood. identify the chemical regulators of blood cell production and describe the process of erythropoiesis. describe the ABO system of red blood cell antigens and explain the significance of the blood types. explain how a blood clot is formed and how it is ultimately destroyed. explain how the acid-base balance of the blood is affected by carbon dioxide and bicarbonate, and describe the roles of the lungs and kidneys in maintaining acid-base balance. 13.
describe the path of the blood through the heart and the function of the atrioventricular and semilunar valves. describe the structures and pathways of the pulmonary and systemic circulations. describe the structures and pathways of electrical impulse conduction in the heart. describe the electrical activity in the sinoatrial node and explain why this tissue functions as the heart's normal pacemaker. relate the time involved in the production of an action potential to the time involved in the contraction of myocardial cells and explain the significance of this relationship. describe the pressure changes that occur in the ventricles during the cardiac cycle and relate these changes to the action of the valves and the flow of blood. explain the origin of the heart sounds and state when in the cardiac cycle these sounds are produced. 14. explain how electrocardiogram waves are produced and relate these waves to other events in the cardiac cycle. 15. compare the structure of an artery and vein, and explain how the structure of each type of vessel relates to its function. 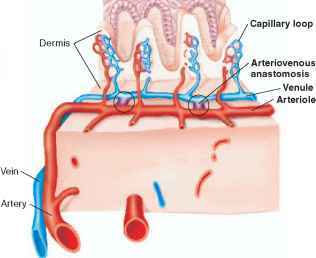 16. describe the structure of capillaries and explain the physiological significance of this structure. 17. explain how atherosclerosis may develop and comment on the significance of this condition. 18. define ischemia and discuss the possible causes of myocardial ischemia. 19. describe some common arrhythmias that can be detected with an ECG. 20. describe the components and functions of the lymphatic system.